One of the Clyde's regular visitors for many years was Princess Cruises' ROYAL PRINCESS, which each summer called at Greenock while on cruises around the British Isles. She was built in Finland in 1984 and was the first large cruiseship to feature all outside cabins. Following delivery, ROYAL PRINCESS spent several years sailing in North American waters, before returning to Europe in the 1990s. She has an overall length of 230.61 metres, and a gross tonnage of 44,588 tons. 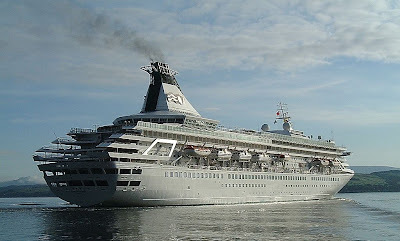 In 2005 she was transferred to the parent P&O Cruises fleet, and following a refit in Germany, emerged as ARTEMIS. She can accommodate up to 1,260 passengers.